Hip arthroscopy is a surgical procedure performed to diagnose and treat conditions of the hip. Two or three 1cm incisions are made to allow passage of a camera (arthroscope) and instruments into the hip joint. It is a form of keyhole surgery. 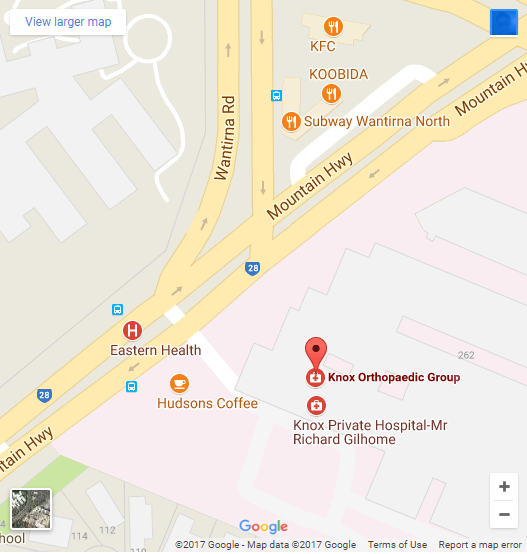 Hip arthroscopy is frequently performed at our practice in Melbourne under a general anaesthetic, however regional (spinal) anaesthesia may be used. Most patients stay overnight and are discharged the following day if pain and swelling are manageable. A physiotherapist will see the patient before discharge to ensure that patients are safe to walk with crutches. The time patients will need to use crutches will depend on the operative findings and the surgery performed. However, most patients will be weight bearing as tolerated with crutches and weaned off them within the first 1 to 2 weeks once pain settles and there is no residual limp. The hip is placed under traction in order to access this deep joint which covered by strong muscles and ligaments. With the aid of x-ray (fluoroscope) a small fine needle is inserted into the hip joint. The arthroscope is safely place into the hip joint using x-ray guidance. Any abnormalities can be identified and treated. The surgery usually takes between 1 to 2 hours but will occasionally take longer when the underlying condition is more complex. Final x-rays are taken to confirm bony removal (this is done during Cam resection or Pincer debridement) is adequate. At the end of the procedure, local anaesthetic is injected into the joint and the hip portals. Other medications, such as cortisone or joint fluid substitutes may be inserted into the hip joint to minimise pain or treat cartilage damage. The small holes are then closed with stitches and a waterproof dressing applied and reinforced with a bulky bandage that is left intact overnight. An ice pack is placed onto the side of the hip. It is common to feel some numbness, discomfort and swelling around the groin and hip immediately after hip arthroscopy. The swelling usually subsides within several days. The discomfort may feel like “saddle soreness” experienced after riding a bicycle or horse for a long time. This subsides after a few hours but occasionally may persist for a few days. It is also expected that there will be some discomfort around the foot and ankle region from the traction boot. This can feel like a “sprained ankle” and this usually resolves soon after the operation but very occasionally may take a few weeks. Mr Ma will usually see patients the night of surgery or the following day to check on progress and to discuss the operative findings. Mr Ma will see patients in his private rooms in Melbourne at around 10 to 14 days to check the wound. Sutures will be removed and further discussion of the operative findings will occur. A copy of the operation report, photograph and DVD containing videos of the surgery will be given to the patient at the consultation. Patients will be given the operation report to take to the physiotherapist, as this will allow customisation of the rehabilitation program. Mr Ma recommends that most patients do not return before two weeks. For patients who perform strenuous and labour intensive work, he recommends not returning to work before six weeks. Most patients will be feeling relatively comfortable with minimal pain at 6 to 8 weeks after hip arthroscopy. More strenuous activities may be commenced around the 8 to 12 week after surgery. At around 3 to 4 months, sports specific retraining and rehabilitation may commence with a view to return to potential competition between 4 to 6 months. Occasionally some patients experience an increase in pain at 6 to 12 weeks post operatively and this is usually related to their increased level of activity. Postoperative pain at this stage can be treated with simple pain relief such as Paracetamol or Nurofen or other anti-inflammatory medications and the application of ice packs and/or heat packs at a later date. Occasionally, an injection of local anaesthetic and cortisone may be helpful in reducing inflammation. There is a risk of complications with any operation. Temporary numbness and discomfort around the groin and genital region and the foot and ankle region. This is directly related to the traction required for hip arthroscopy. Pressure sores around the groin or foot and blistering. Nerve damage and numbness around the portal site. Superficial wound infection or delayed wound healing. Impaired blood supply to the femoral head (osteonecrosis/avascular necrosis). Excessive swelling of the thigh or swelling in the abdominal cavity. There is a potential risk with hip arthroscopy that patients may experience persistent pain in the hip or there may be a progression of degenerative changes in the hip. Debridement (removal of the torn part) and smoothing of damaged tissue. Surgical repair with special sutures that are inserted through the bone (special bone anchors). It is not uncommon that labral tears may not be seen on preoperative MRI scans. Often the MRI or other imaging/scans underestimate the true damage. During hip arthroscopy at our practice in Melbourne, Mr Ma will repair or debride any damage to the labrum and articular cartilage (this may be a chondral flap). He will correct the FAI by trimming the excessive bony rim of the acetabulum and he will also shave down the bump on the femoral head.